A few weeks back, during a time of intense skies and clear seas, I went several times to a dive site that features a sponge garden. Tucked into Sydney Harbour, the site’s name, appropriately for those days, is Fairlight. 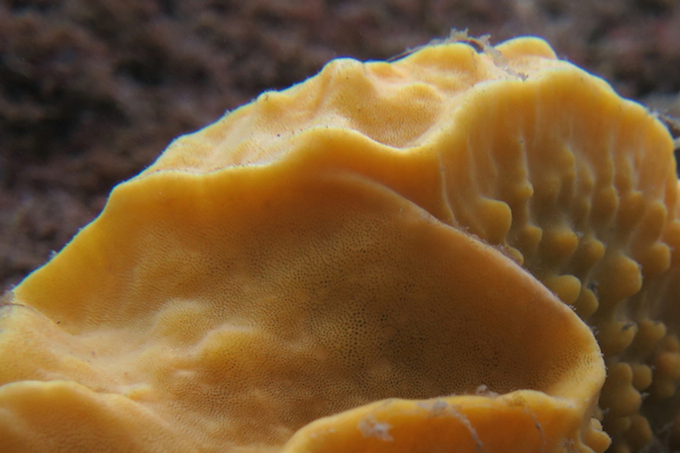 Sponges are friendly to deeper waters. In places where seaweed dominates the shallows, sometimes when you get just below the well-lit level, sponges appear in the gloom. Last month, though, the sun reached far down into the harbour, and the sponges and other animals were illuminated. 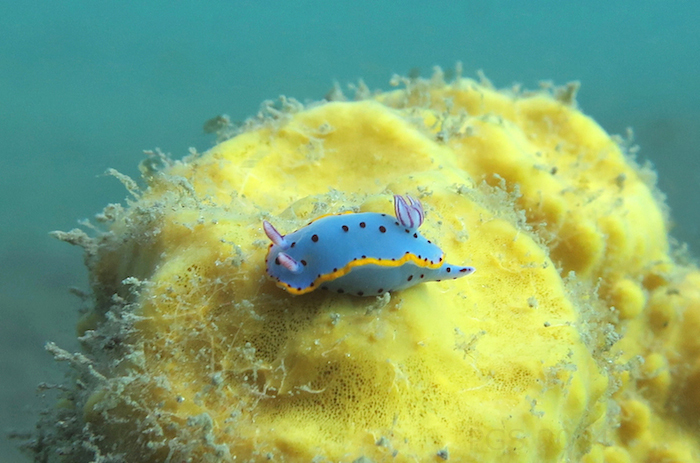 The top photo is a nudibranch, Hypselodoris bennetti, atop a yellow sponge. 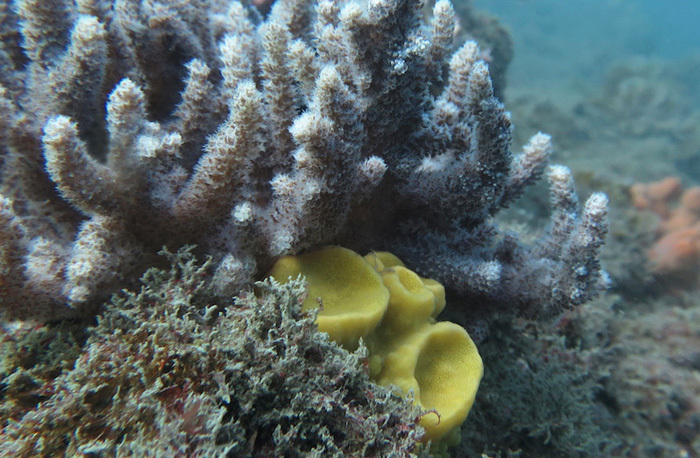 The second has a sponge under a soft coral of some kind. Here’s another shot, of a sparser part of the garden. Sponges are notable animals for the projects of this website, as they are almost the only animals that do not have a nervous system of any kind. (Almost the only: the others are the tiny Placozoans). * Some of what nervous systems do in animals like us, though, sponges achieve by other means. 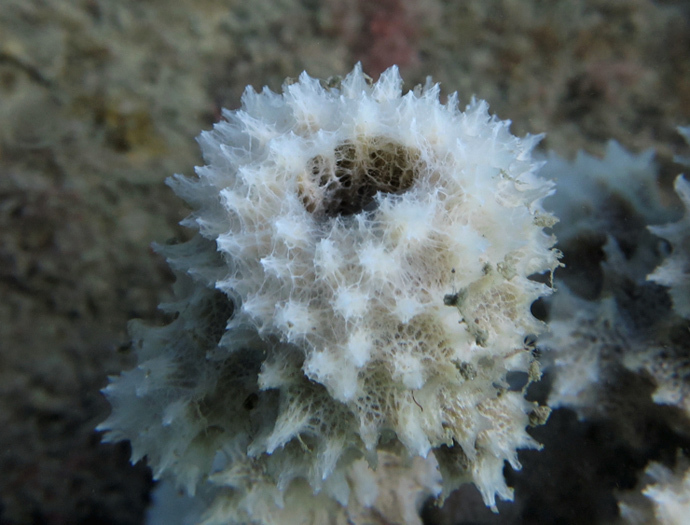 Despite their stationary adult existence and simple lives, sponges do have some behaviors, and other whole-body activities that require tying the parts together. Thousands of feet below the level of the sponges of Fairlight are the deep-sea Glass Sponges, or Hexactinellida. In the 1990s Sally Leys, George Mackie and Robert Meech discovered that some Glass Sponges engage in small and silent behaviors, electrically controlled. A Glass Sponge usually pumps water through its body in a continual way. But in response to some stimuli – a plucking of one tiny star-like element of its skeleton – the pumping ceases. Somehow the whole sponge can react to an event occurring at a small place within it. The way this works is dependent on a loss of boundaries between the sponge’s cells. As the sponge grows up, most of its cells fuse, forming a single net over the glass structure that supports its body. Electrically, a Glass Sponge behaves like a single huge cell; a pulse of charge can run uninterrupted over the whole. 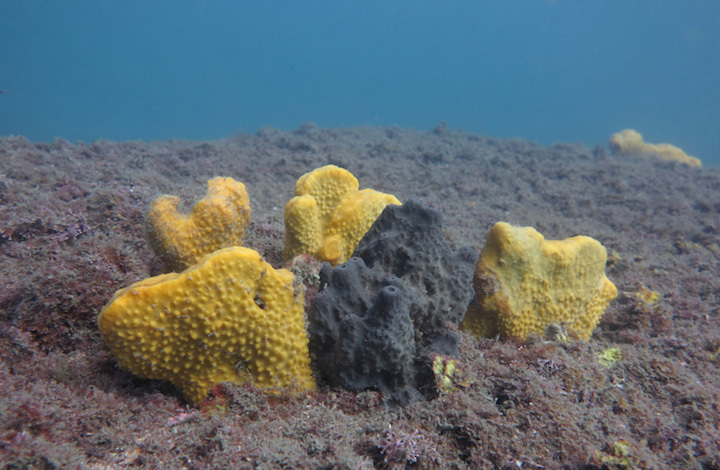 Much more recently, hints have emerged that some other sponges may be making use of light as an internal signaling system. The paper, by Werner Müller and his colleagues, is here. Their sponges have a light-making chemical, a luciferase, another chemical for detecting light, and tiny skeletal elements that conduct it. If this system is real, what are they are doing with it? The hypothesis is that the making and detecting of light pulses enables the sponge to establish a day-night cycle of activity despite their dark environment. With so little light reaching them from above, tiny pulses of sponge-made light can function as internal signals, spanning long distances within the animal’s body, an optical alternative to the electro-chemical signaling system found in animals like us. This is early work on a hard-to-study animal. But I hope it’s true. It also raises questions about what nervous systems are. Above in this post I gave the standard summary: “sponges have no nervous systems.” Suppose it turns out that some sponges contain a control system based on the production and reception of light, and use it to control whole-organism activities of some sort. This would certainly be the discovery of something like a nervous system, and it would be a bad idea to get too obsessive about the term “nervous system” and its meaning. Nervous systems of the familiar kind, with neurons and synapses, evolved from simpler control devices, and simpler concatenations of signal production and reception mechanisms. The borders of the category nervous system will certainly be vague with respect to time; perhaps the borders are being probed, also, in some unexpected regions of space. Here is one more shot of a Fairlight sponge, bathing in a clear and sunny winter’s extra dose of light from above. Notes: The labs of Sally Leys and Robert Meech continue to produce work on these animals and their hidden behaviors. A review of some of their work is here. * I just found out that the tiny parasitic myxozoans, which were once thought to be “protozoa” (hence outside the animals), but turn out to be cnidarians, are another case of an animal with no nervous system. This entry was posted in Nervous Systems, Tree of Life and tagged sponge. Bookmark the permalink. Unlike you, I am *fascinated* by the question of what counts as a “nervous system” — what I’m interested in actually is something like a master/control internal signaling system, and doesn’t necessarily need to be composed of neurons and synapses and so forth. The system you described in the glass sponge is so fascinating and confounding. How are these little guys even still alive? I feel like this system is too easily stressed – although the stress response is to stop pulsing, which may save energy at the end of the day? Hm. I just bought Chalmowitz’s book – thanks for the tip. It does look good.